I was very fortunate to be invited to catch a dress rehearsal of FROM WHITE PLAINS at Xavier University this week. Last semester marked the beginning of the Theatre degree program at Xavier University and they were off and running with an amazing production (in conjunction with the team at Cincinnati Shakespeare Company) of THE CRUCIBLE last October. And they’re on a roll, because this next production is a real winner. It’s billed as a show about bullying and I suppose that’s true. But in a bigger context this is a show about relationships. And are they ever complicated! First, we meet John and Ethan, two best bros who are both reeling from something they saw on television. We quickly find out that Ethan has been outed on national television as the inspiration for an Oscar award winning movie about bullying . . . and let’s just say that he isn’t the victim. At least not back then. “Ethan” is played by Patrick McWilliams and when you see the show you’ll be drawn in instantly from the first scene by the physicality of his emotion. “John,” played by freshman Mac Blais with a bright spark in his eye, has a secret or two of his own. He, too, uses his entire body – especially his face and eyes – to convey feelings. I never felt pulled “out of the moment” in this show even when the dialogue seemed a tad flat or unnatural. Both of these young men have bright futures. Xavier senior Patrick Phillips (who was recognized by the League of Cincinnati Theatres for his work as Rev. Hale in THE CRUCIBLE) plays Gregory, the not-completely-out-of-the-closet boyfriend to Oscar-winning screenwriter “Dennis,” played by Sean Burlingame. Even though Dennis’s film won the Oscar and is getting lots of national attention, he just can’t let go of his anger and hurt over the past. I wrote in big bold letters on my notepad when these two began their first scene together: BELIEVABLE. Both of these actors made me believe their characters could actually be in a relationship. Burlingame brilliantly tackles the complexity of Dennis’ deeply rooted anger without worrying about whether or not the character is likable or not. I began wondering why on earth Gregory would tolerate being treated so neglectfully and then we learn about his own neurosis and internal struggles. Phillips has a vulnerability as an actor that allows him the freedom to play this character with realism yet never going over the top. It’s a restrained, brilliant performance. This play understands how gray life can be and when Dennis finally breaks down and talks about his own hurts in the show’s climax, I began to “get” his motivations, his anger, his guardedness. I can’t overstate how Burlingame seems to fully grasp the complexity of this character in his nuance and poise on stage. He is a standout and I can’t wait to see what he does next. Authenticity abounds as the relationships develop, break down, and works toward resolution. 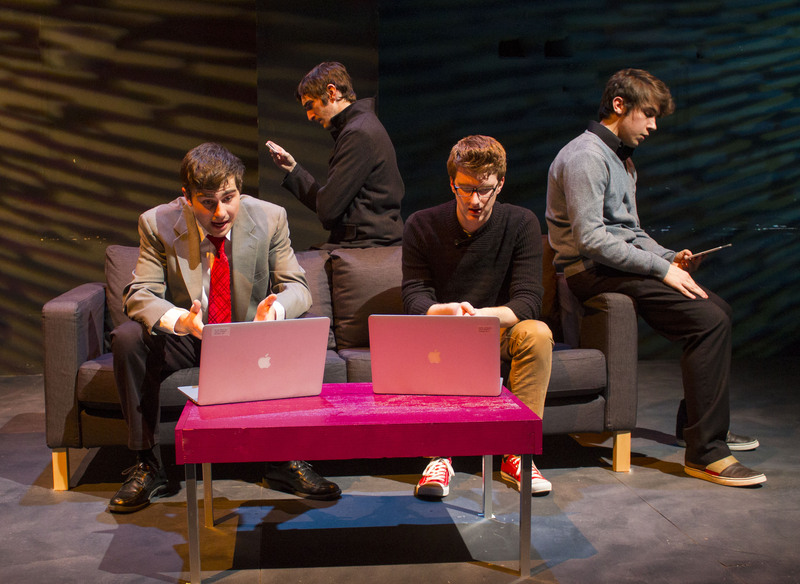 The characters find themselves nose first in their phones and laptops and iPads, a common and concerning trend in contemporary society. 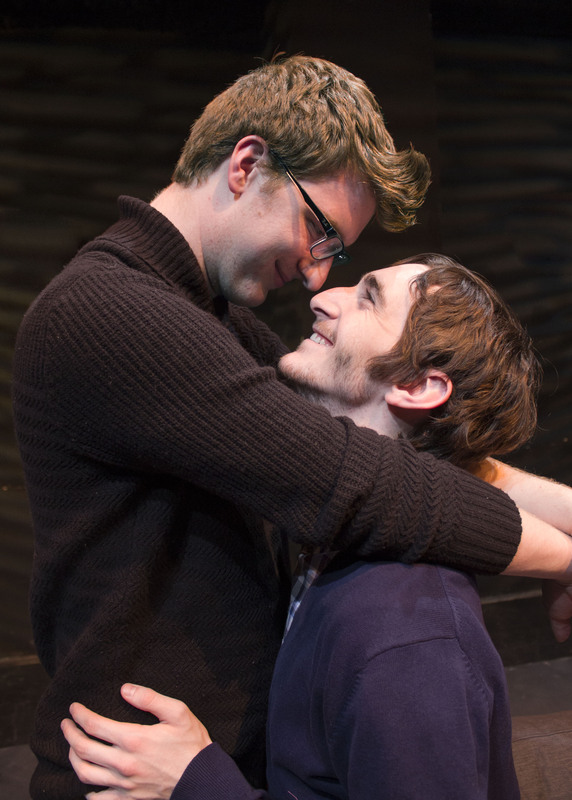 John and Ethan have difficulty talking about their feelings, especially when its about their heterosexual friendship. Guys just don’t do that, of course, but the circumstances in their lives force them to. Just like in real life. Gregory and Dennis don’t see eye to eye and instead of resolving their conflict they just put it aside until their next fight. Just like in real life. Ethan spirals downhill as his past is exposed and he loses everything – a consequence of the past. You can see it in the Kathleen Rossmann’s costumes and in McWilliams posture. It’s marvelous how well these young actors and seem to understand themselves and their scene partners and I have to wonder how director Craig Wesley Divino managed to help these kids find such deep understanding of empathy. Because that’s REALLY what this play is about. Putting yourself in another man’s shoes is one of my favorite themes in any work of art – and this play explores it better than most I’ve seen. I was near tears for most of the run-through. I felt sorry for these characters, for the pain they were feeling and causing one another. And mostly I was moved by the message that we all really need to try to stop hurting each other and just listen. Bullying is a hot topic and this play tackles it head on but from both sides and several angles. The art department has several exhibits on display about bullying and the themes in the show as you should take time to enjoy them as you enter the theater and head to the makeshift black-box space on the stage of the Gallagher Center. I was moved from start to finish by this amazing script and these talented young actors. Xavier Theatre is demanding our attention. I love this play. You MUST to see this marvelous piece of theatre. FROM WHITE PLAINS opens Friday February 14th and runs through 2/22 at Xavier University’s Gallagher Student Center Theater. Tickets are only $15 ($10 for seniors and Xavier faculty/staff/students. Tickets are available here.